As You Change Speed What Should Happen To Your Stroke Rate And Stroke Length? If I'm running, my cadence stays the same (about 180) regardless of how fast I go. The only difference would be how much I push off the ground, thereby lengthening my stride length. That extra effort of pushing off the ground harder to get a bigger stride, is ultimately what gains speed, not the cadence increase. As I'm sure you know this already, I only point it out because I'm confused as to how this is analogous in swimming. It seems as though the way you describe stroke rate is that it should be the same for you as a swimmer once you find your optimal rate. And that rate matters so much in terms of the actual mechanics of your swimming (overgliding if it's too slow and chopping hard if it's too fast). But how is it possible to ever change speeds then?? If I slow my stroke rate, I mess up my form, and same if I increase it too much. So then do I have to shorten or lengthen my stroke length (which doesn't seem possible really). Or, the only thing I can come up with is pushing less water or using less effort on the catch so that your "push off the ground" (so to speak), does not require as much effort and you will therefore go slower. The short answer to Andrew's question is that as you change speed, both your stroke rate and stroke length change. Swimming faster normally means both a slightly longer stroke and a slightly faster turnover. - Your stroke length is how far you travel on each stroke. One way of measuring this is to count your strokes over a length of the pool - the fewer strokes you take the longer your stroke length. - Your stroke rate is how fast you are turning your arms over - i.e. your cadence. We normally quote this is strokes per minute. You can measure this with a specialist stop watch and control it using a stroke rate beeper such as a Finis Tempo Trainer Pro. Note that in the early 1990s it became popular to count strokes per length driven by the belief that a longer stroke always meant a more efficient stroke. We now understand that this is not the case and there are distinct dangers with trying to reduce your stroke count too far. Instead you need to find a balance between the length and rate of your stroke for you as an individual. 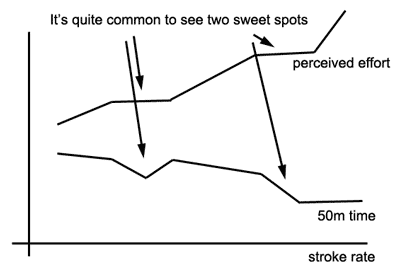 So how do you find this sweet spot and swim "optimally" at different effort levels? Right at the front of the stroke you extend forwards underwater and get a hold of the water before pressing it backwards. 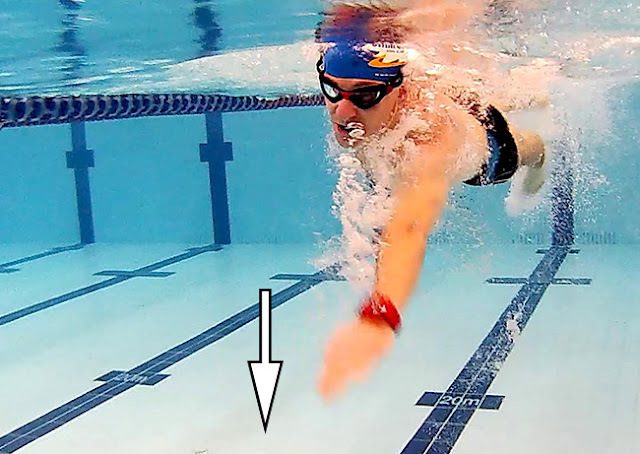 This initial engagement with the water is called your "catch" and your catch technique can have a dramatic effect on your stroke rate. Generally speaking, swimmers with a better catch swim at a higher stroke rate without fighting the water. This is one of the secrets to swimming fast and efficiently. Pressing down on the water, pressing wide or even pressing forwards (Overgliding) can dramatically reduce your stroke rate. Trying to optimise your stroke rate with any of these flaws in place will prove a frustrating experience. So before you go ahead and run a ramp test (described below) do some work on fine tuning your catch. OK, so you're confident your catch is half-decent, what now? You need to conduct a experiment on your swimming that we call a "Ramp Test". The test involves you swimming a series of 50 meters or 50 yards starting at a low stroke rate and progressively increasing the rate each 50. You control your stroke rate with a Tempo Trainer Pro beeping the rhythm to you and record your time per 50, your strokes per length and how it felt in terms of effort. Ideally you run this blind without knowing the stroke rate you are at and have a friend time you, count your strokes per 50 and record everything on the stroke rate sheet. As you increase stroke rate you'll go progressively quicker up to a certain point where you really start to fight things and can't continue. Stop there! When you look at the results you should find at least one "sweet spot" where your stroke "clicks into place" and works nicely. There might be a noticeable drop in effort at this point and/or an increase in speed too. Of course once you have found these sweet spots you can target them in training over longer swims and key training sets. As you develop that sense of rhythm at which you best perform you can use it in races for best performance. But what if you want to swim at a pace faster or slower than your sweet spot? Perhaps you want to smoothly change your pace during a race for tactical reasons. Swim 4x 200m/yds with a Finis Tempo Trainer Pro set to a stroke rate you might naturally use for steady paced swimming. If you don't have a Tempo Trainer, aim to maintain a similar stroke cadence throughout. all the 200s. First 200: Light catch - "Granny Gear"
Second 200: "Apply a sense of firmness"
Think of it like changing the gears on your bike but maintaining the same cadence through the range. As you adapt to doing this you should effectively broaden the speed range you can swim within your sweet-spot stroke-rate. 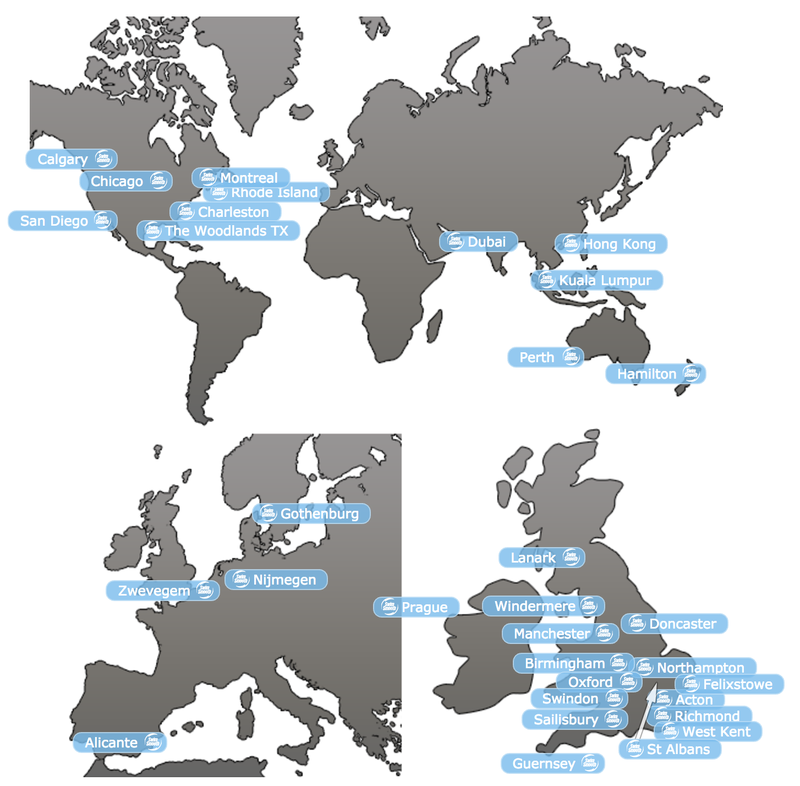 Swim Smooth are very proud to announce the certification of four new Swim Smooth Coaches in Tunbridge Wells and Manchester - UK, San Diego - California and Calgary - Canada. Congratulations Laura, Mary, Lucy and John! 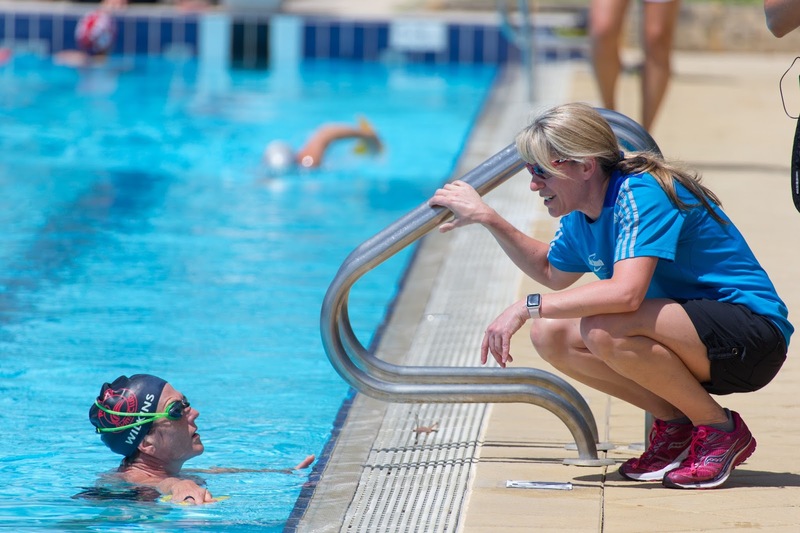 Master teacher and coach, Laura, has been a swimming teacher and coach for 17 years. Laura went on to coordinate her own swim school alongside Cannons Health and Fitness and Swimming Nature at the age of 19, and combined the manual manipulation techniques of Shaw, with elite stroke techniques from ex-Olympic swimmers with whom Laura swam and studied with, to the forefront of her coaching style. Laura co-wrote the First Choice Swim Abroad programme and implemented it’s curriculum through Europe from 2006-2007. Laura spent her youth competing at County and National championships for Hertfordshire and GB, and held the 100M Butterfly and IM record for her age group for Hertfordshire. Laura is currently the KC ASA Open Water Manager and her passion to drive the sport forwards has meant she is the head of the ASA Open Water Committee. Laura specialises in nervous and new swimmers of all ages and abilities, and supports their learning in a supportive, nurturing and empathetic manner which has seen her athletes continue to Triathlon AG placing, and World Series qualifying, as well as producing pool and open water County and National level swimmers. Mary is thrilled to be introducing Calgary to the Swim Smooth Coaching method! Mary has been swimming her whole life – first as a competitive age group swimmer, then as a member of a NCAA University team, and most recently through the sport of Triathlon. She progressed from sprint distance to Ironman distance races and then started sharing her passion for the sport through coaching. After 5 years of focusing on Triathlon coaching, and the realization that swimming is often the limiter for triathletes, she decided to expand her focus on swim coaching. In 2016, she attended a Swim Smooth coaching course in California where she fine-tuned her swim coaching skills. Then, in January 2017, she continued her education and training under Swim Smooth mentorship, in Perth, in order to become the first female Swim Smooth Certified Coach in Canada and only in Western Canada. She has been told by her swimmers that her squad sessions both in the pool and in open water are “focused, fun and fly by”. She finds it rewarding to work with both newbies and lifetime swimmers and enjoys the camaraderie that exists within her squad. She finds that if swimmers supplement regular squad sessions with periodic video analysis and stroke correction sessions with her, a swimmer of any ability will improve their technique, gain efficiency and get faster! Lucy is a "Smooth" with a strong swimming background, having spent most of her years growing up around a poolside. 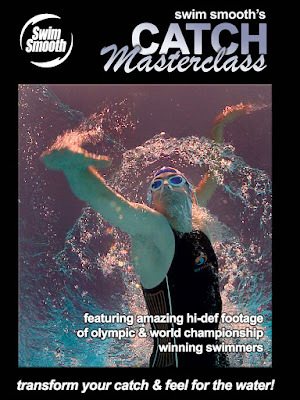 She continues to compete at a Masters level and has broken individual Masters British records in the 100 and 200 butterfly and has been on 6 Masters World record breaking relay teams. It was only as an adult that she discovered the joys of open water swimming and using the Swim Smooth coaching system she successfully made the transition from the pool to the open water. Her open water highlight to date was being part of the fastest ever female double English Channel relay in 2015. Lucy has been lucky enough to follow turn her passion into a career and to help get others enjoying their swimming; she has been teaching and coaching full time for over 10 years. 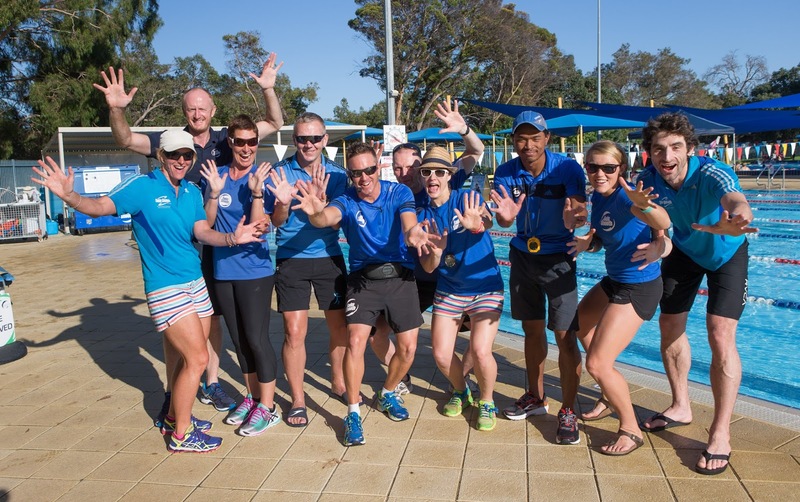 In this time she’s worked with all ages and abilities of swimmers from those nervously taking their first strokes right up to those training for world age group triathlon championships and solo English Channel swims. Her aims are to get you swimming better and thinking differently about your swimming! As the first Swim Smooth Certified Coach in California, John is pumped up to bring the professionalism and passion of Swim Smooth to San Diego. John discovered Swim Smooth in 2013 during a 4-year corporate assignment in Perth, Australia. 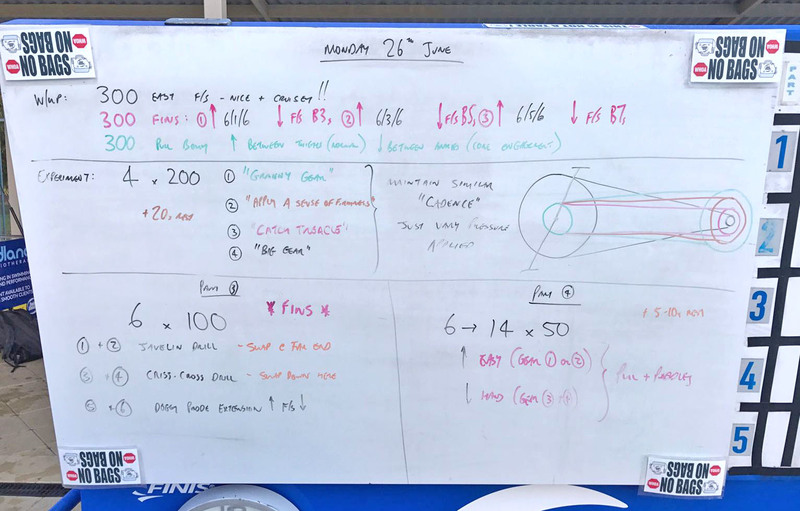 Already in the swim coaching business, John quickly identified the unique, passionate and effective methods of Swim Smooth. His pursuit of stroke efficiency has helped him overcome his Overglider tendencies and to successfully train for and complete the 20km Rottnest channel swim in 2016 in just over 6-hours. Along with his Swim Smooth Coaching Certification, John is passionate about putting his long history of coaching and competing in a variety sports, including 15 years as a triathlete and open water swimmer, in to practice to inspire swimmers of all levels to enjoy swimming, be challenged, and become more efficient and faster swimmers. John is also a USAT Youth and junior Certified Coach, Triathlon Australia Certified Coach, US Masters Certified Level 2 Swim Coach and a TriDot triathlon coach. The New Platysens Marlin Is Now In Stock!